March | 2015 | Franchising You. Franchising is fascinating. It offers career opportunities to millions of people all over the world. There are numerous chances for career advancement and development at many different levels throughout our franchise system. Do you ever dream about becoming a business owner but find yourself afraid to take the leap? If you answered yes, franchising might be the answer! If you are new to the franchising industry, there is an abundant amount of information to learn before jumping the gun and embarking on a new business adventure. Franchising allows you to go into business for yourself but not by yourself, providing an opportunity to become a business owner with your very own support system. First and foremost, when you become a franchisee, you are connecting with an already established product or service. You are also merging with a brand that consumers are already familiar with. Finally, you are joining a system with proven methods and success. ou are not completely independent from the brand in which you are franchising. Franchisees are required to follow the franchise agreement they sign. Many people love the idea of going into business already set up for success and find the security and support that comes along with that incredibly refreshing. If this does not appeal to you, perhaps franchising may not be for you. What should I know before becoming a franchisee? What are my personal and professional goals and will franchising help me attain them? Am I able to follow the franchise business model? Am I able to make a specific financial investment? Does the franchisor provide a strong franchise support system? Is the business viable long-term? What kind of business opportunity is there? When joining the franchise industry, people select a business based on a variety of circumstances. For some, they base it on personal interest, finances, revenue, and being their own boss. Are you looking for an opportunity to become financially stable, orare you looking to increase your wealth as an investment opportunity? After defining your purpose, you will have a better idea of what you want to accomplish and where you want to franchise. Whether you have worked in the franchise world or not, there are certain aspects you should know about the brand you are considering franchising with. For instance, you should know the brand’s reputation, growth opportunities, franchisee success stories, return on investment, territories and brand recognition. Most importantly, you need to have a strong understanding of the franchisee/franchisor relationship and what it means to the company, and you as a person interested in the system. Franchising is a large investment and a lot to consider. Hopefully the above information will help you decide if franchising is for you. What it’s like to franchise with TWO MEN AND A TRUCK®? Did you know one in six people move in the United States, annually? No matter the state our economy is in, people are constantly moving, downsizing, and relocating; moving services are always in demand. TWO MEN AND A TRUCK® is a proven service that works. With 62 straight months of growth, our brand is ideal to grow with and invest in. The franchisee/franchisor relationship is one we strongly value. If you are considering becoming a franchisee in our system, it’s important to know our relationship with you doesn’t stop after you sign the franchise agreement. TWO MEN AND A TRUCK® views its franchisees as a long-term partners. We have vast support from training documents, and employees with specialized skills to help you succeed. If you’re interested in franchising with us, please visit twomenandatruckfranchising.com! TWO MEN AND A TRUCK® is the first and largest franchise moving company in the United States. Let us help move your career forward! Being a TWO MEN AND A TRUCK® franchisee allows you to not only own and run a successful business, but provides the fulfilling opportunity to help establish and grow your team members’ careers. At TWO MEN AND A TRUCK® our core purpose is to move people forward. It’s not just a phrase that we post on our wall, but rather something our franchisees and teams embody and live every day. We don’t only move peoples’ belongings, we want to ensure we move our frontline staff forward, not only personally but also professionally. In fact, 75% of our managers started in frontline positions and moved into management because they were passionate about TWO MEN AND A TRUCK® and had a strong support system to encourage them along the way. One of our leading franchise teams, the Judson group, which has locations across the country from Salt Lake City to Boston, embodies our core purpose and is continually looking for team members who have what it takes to be Move Heroes. We met with them to learn what they look for in talented employees as well as how to ensure employee retention at their franchise locations. Q: What type of career opportunities are available at your franchises? A: We really have endless career opportunities at our locations across the nation. In fact, we have some franchise partners now that started out being movers. For example, Jeff Lodike and Steve West are our friends and business partners who are currently busy opening their Sioux Falls franchise location. Jeff started as a driver and eventually became our move manager while Steve came on as a dual general manager. Sioux Falls will be the first franchise location in South Dakota and marks the 39th state for brand presence and we can’t wait to see what they do. Q: What type of qualities do you look for in applicants? A: Drive, ambition, and confidence are the three most important qualities we look for in every position. Q: What do you do to move people forward in your franchise locations? A: Our goal is to not only hire employees to exceed our customers’ expectations but we also want to give them the opportunity to learn and succeed in their own career paths. With every person we hire, our ultimate goal is for them to become a partner. Q: Now that you’ve found talented employees, how do you successfully retain employees and keep them happy? A: It’s all about the culture. It’s vital to make your business the one that’s fun to go to everyday and that people are proud to be part of. The key is to really listen to what your employees and partners are saying. Q: What is your biggest strategy when it comes to recruiting for jobs? What has been the most successful? A: I would say our most successful avenue has been reaching out to local colleges. We will get a lot of applicants this summer from the local community colleges we’ve visited since it is a perfect summer job that can later turn in to a career. Lately, we have had a lot of success with applicants from military organizations since their core values align so perfectly with ours. Are you interested in joining one of the top franchise systems in America? To learn more about TWO MEN AND A TRUCK® franchising opportunities visit twomenandatruckfranchising.com or visit careers.twomenandatruck.com to inquire about a career. Upon recently reading an Entrepreneur article on our Greenville, N.C. TWO MEN AND A TRUCK® Franchisee Brian Churney and the noises he listens to in his franchise to indicate he’s operating a healthy business, it inspired me to think about our franchise system’s success over the past six years — clearly not just sounds to be heard. But emotions to be felt, personal career growth to be seen, and businesses flourishing all around the country and world. We are a franchise system. A powerful one at that. We move people and businesses every day. Some could say we are the experts in what is the most stressful life event. We are the fastest-growing moving franchise system in the world. And we aren’t stopping anytime soon. This leads me to share one of the system’s best growth stories. Franchisee John Judson and his family grew a career with the TWO MEN AND A TRUCK® system over the last 20 years. It started with one single franchise in St. Louis, Mo., back in 1994. And today, it’s now a 15-franchise operation in four metropolitan areas — St. Louis, Chicago, Salt Lake City, and Boston. In 2001, John brought on his brother Jason as a partner of the business after working together for four years. John and Jason continue to invest not only in the business, but the people they hire. This practice has allowed their franchises to grow exponentially — shattering system records left and right and giving them additional opportunities to expand their franchise profile across the country. John and Jason have set an excellent example of what multi-unit franchise leadership looks like within the TWO MEN AND A TRUCK® system. If you’re interested in franchising information, please visit twomenandatruckfranchising.com! TWO MEN AND A TRUCK® is the first and largest franchise moving company in the United States. Let us help move your career forward! 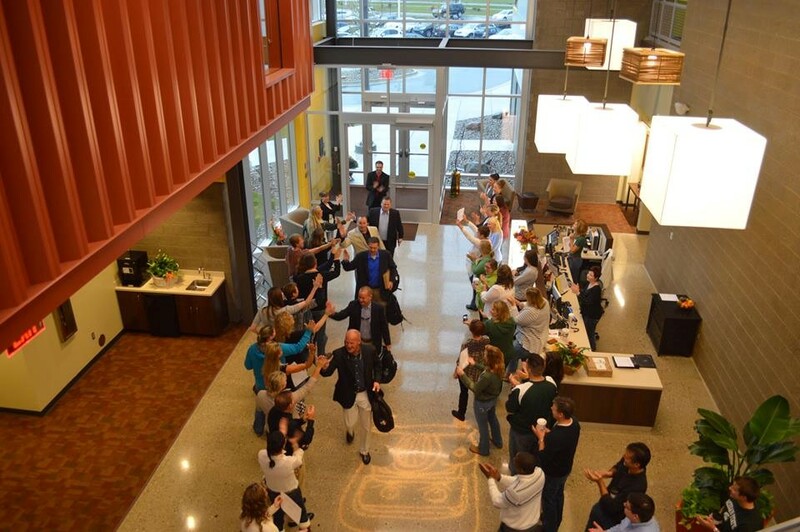 John Judson and Jason Judson along with their team of franchisee partners — Joel Trost, Jeff Lodike, and Steve West — get high fives from the corporate office team for a record-breaking 2014. 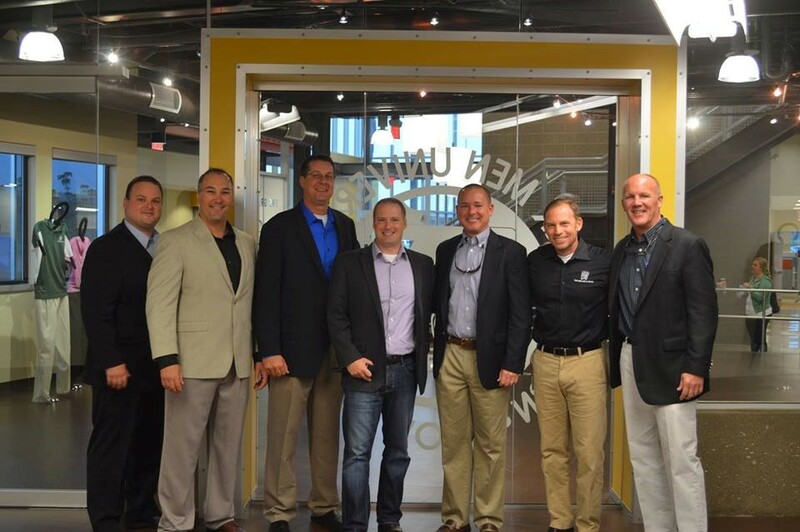 From left to right: Franchisees Joel Trost, Jeff Lodike, Steve West, President Randy Shacka, Franchisee Jason Judson, CEO Brig Sorber and Franchisee John Judson.